To make matters even more confusing, we were just getting ready for practice and I play a keyboard! It took a few minutes to get it all cleared up. I had purchased a cordless keyboard for the computer. I move the keyboard up and down, from the desk to the keyboard drawer, depending on whether I am typing off of notes or working with numbers. I also like to read Facebook while I eat lunch. We have gone through two keyboards with the cords either pulling loose at the computer or at the keyboard itself. I had a coupon that covered most of the cost and splurged on it. I was amazed how removing that one bit of frustration made the day go more smoothly. I no longer had to shut the computer down, pull out the CPU and check to see if it pulled loose. I stopped worrying about the cords coming completely off of the unit. I was free from frustration! Time is money; removing a frustration will save you time, and in the long run, money. 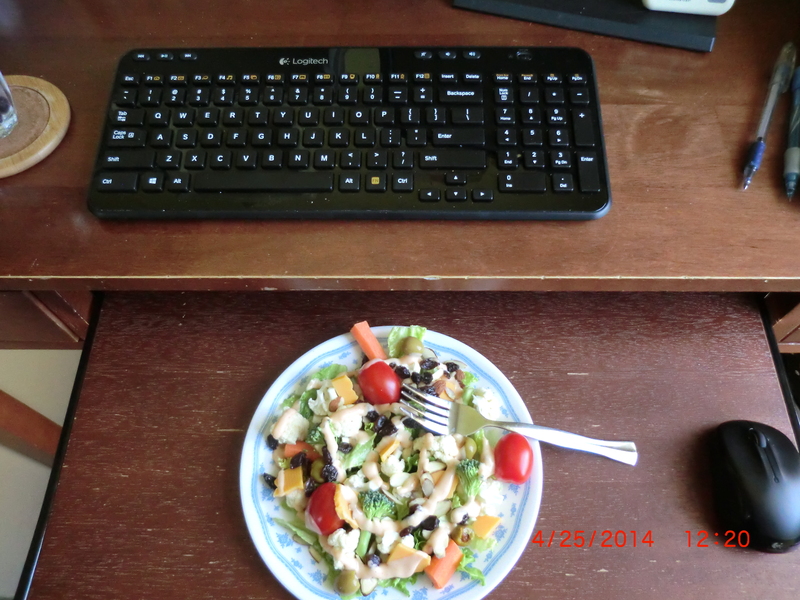 I put the keyboard on the desk while I eat lunch. This entry was posted in Important Things and tagged Important Things, keyboard drawer by Frugal Fish. Bookmark the permalink.